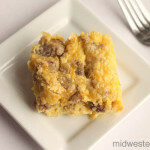 I decided to make egg casserole on a whim today because I had a pound of sausage that I had thawed and needed to cook. The egg casserole recipe that I used was adapted from a Betty Crocker recipe. I wanted to make it kid-friendly, so I decided against adding salsa to it and kept it pretty basic. I always add either salsa or Cholula hot sauce to my own eggs once I get them on my plate. This recipe uses Bisquick, which I happen to love using in my casserole recipes. Growing up, my parents used to make a cheeseburger casserole with Bisquick that was fantastic. It’s something that I’ve always kept in the house as an adult also because it is so easy to use in both breakfast and dinner meals. Easy Egg Casserole that is perfect for breakfast! Brown sausage in a medium skillet. Drain. In a large bowl, combine eggs, Bisquick, and milk until well blended. 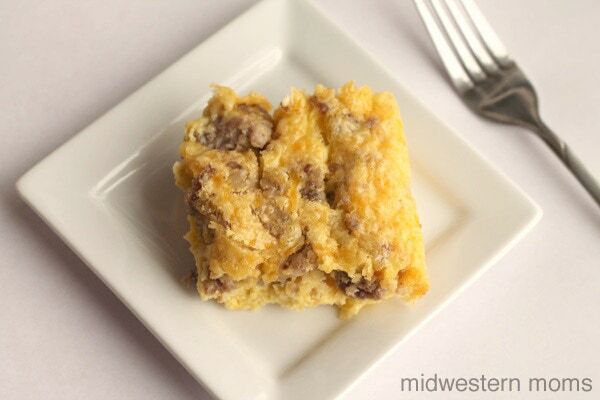 Mix in sausage and cheese to and pour into a 9″x13″ baking dish. When it comes to making breakfast, some days we do cereal, and others I like to cook a large breakfast. How about you? What does your family enjoy for breakfast? Do you like egg casserole?